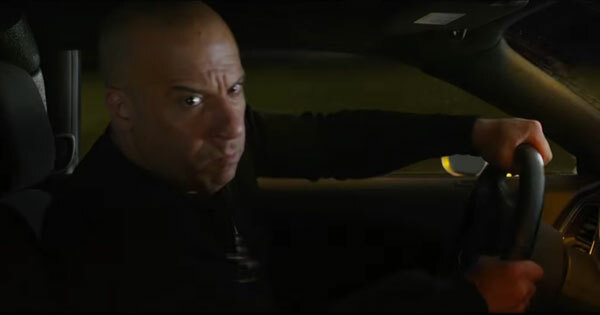 As a guy who loves driving cars, I must say there's nothing more enjoyable than sitting in a plush and spotless cabin as you cruise down our chaotic and congested streets. As a matter of fact, keeping your car's interior fresh lessens the stress induced by your surroundings. 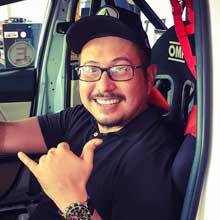 To maintain my car's cabin, I invested and learned through experimentation on how to cope with the challenges of aesthetic maintenance, while keeping it simple, practical, and effective. Obviously, this is crucial in order to determine what succeeding steps you'll take for effective removal. If it's liquid such as coffee, tea, soda, or bodily fluids, isolate the area immediately in order to lessen contamination and make the clean-up easier. Microtex Quickleen - This is by far the most readily available, versatile, and effective solution for cleaning out dirt and stains from your sidings, seat upholstery, and ceiling lining. It's very affordable, too! All you'll need is two soft microfiber towels and a small soft-bristled toothbrush for stubborn stains like chocolate or blood. Even rust stains can be significantly reduced by the use of this. Make sure you are doing the work in a well-ventilated area as its vapors may irritate your eyes and sinuses. Using a face mask is highly recommended. The rule of thumb when tackling stains is to work the area as gently as possible, especially with your ceiling's sensitive lining, so as to retain the fabric's look after treatment. All too often, folks tend to overwork an area to a point where the upholstery turns fluffy and ugly. I've always advised others to let the product do the work rather than you working the product. A degree of patience and finesse are always a must for optimal results. To begin, you first vacuum the portion/s to be treated to remove loose dirt. 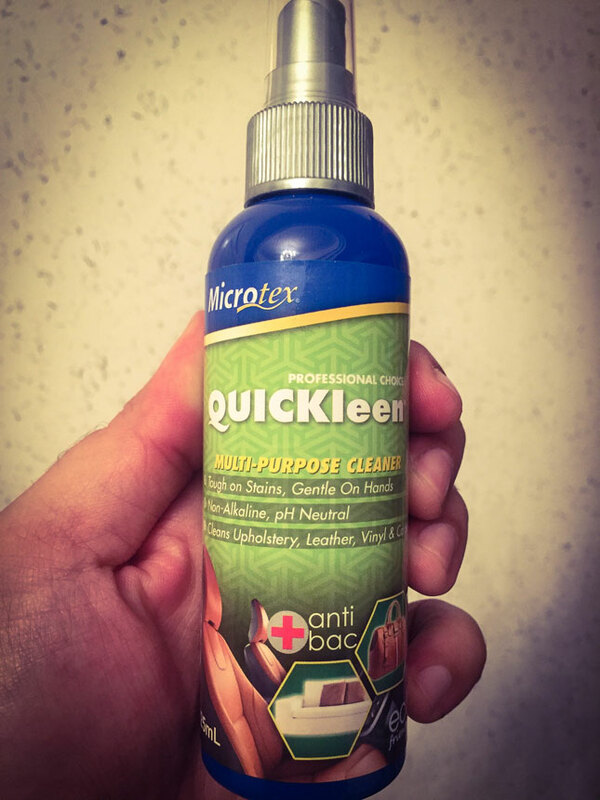 Spray a generous amount of Quickleen over the stain and let it soak before attempting to dab and wipe with the first microfiber towel. After a minute or so, using the same microfiber towel, apply downward pressure onto the affected area in order to start loosening the stain from the fabric, bringing it outward followed by gently rubbing the towel from side to side over it. If using the towel isn't enough, then the soft-bristled toothbrush should help further. The solution will tend to foam up a bit. That's normal. Once you've seen an improvement, wipe off excess product with the dry microfiber towel and allow the area to dry. Repeat if necessary. If you're dealing with ink stains from a pen or a marker, soak the area with 70% isopropyl alcohol and repeat the steps above with Quickleen. Just have some paper towels ready to soak it up before using Quickleen to finish it off. Turtle Wax Oxy Power Out - This product works well with treating your vehicle's carpeting and textile mats. It effectively lifts ground-in dirt and stains with its hardworking thick foam. As we did using Quickleen, thoroughly vacuum the area after removing the floor mats. Keep the doors open to ensure maximum ventilation. Spray the foam liberally over the affected area and let it soak for 5-10 minutes to breakdown the molecular adhesion of the stain. Though the aerosol can comes with a heavy duty brush surrounding its nozzle, I suggest using a separate soft-bristled brush to handle the stain. Again, keeping your carpeting intact is top priority here. Once the Oxy Power Out has soaked into the fabric, spray another thick layer then brush the stain. Wipe off excess product to inspect the results. Repeat if necessary. When you've achieved a desirable outcome, use a clean towel to absorb all the chemicals. Apply firm downward force to squeeze out all moisture that may have embedded itself not only in the carpeting, but also in the thin layer of dense foam beneath it. The last thing you want is a 'basahan' stench in your cabin so do allow more than ample time for carpeting/matting to dry. Sunlight is definitely your friend in this case as the product doesn't dry out as fast as Quickleen does. Using Quickleen in conjuction with Oxy Power Out is sure to give more gratifying results while maintaining the fabric's beauty. Turtle Wax's Bug & Tar Remover - In case you have the misfortune of getting tar or nasty gum in your carpet, this should be able to effectively dissolve them, followed by a thorough clean-up with Oxy Power Out. TexGuard Fabric Protector - After making your upholstery spotless, the smart thing to do is to create a protective barrier to repel future stains. 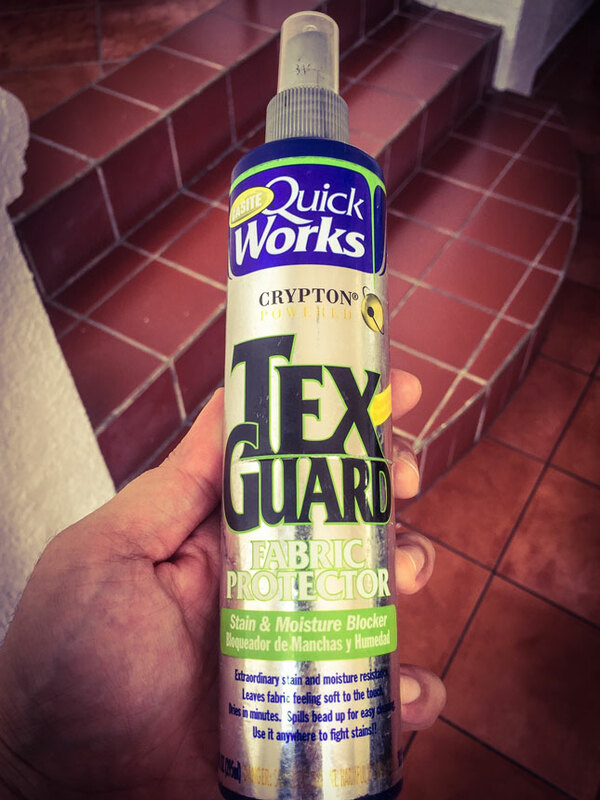 TexGuard Fabric Protector is by far the best off-the-shelf product for the job. This is sold exclusively at Concorde outlets. When my daughter was still a baby, she vomited on the backseat of my car which was lined with upholstery. Thankfully, I treated my seats with TexGuard prior to the incident and I was amazed that no gastric fluids seeped into the fabric, and I was able to wipe off the mess with no fuss at all. It has been a mainstay in my detailing arsenal since. Part of the joy of car ownership is not just being able to drive your four-wheeled machine around with pride, but also being able to maintain its beauty both inside and out. Keeping your interiors in pristine condition definitely adds value to your vehicle and creates a zen-like experience for both driver and passengers.